The Bravo! Award for the week of January 8th went to Substitute Coordinator David Scott. He was nominated by Fort Lewis Mesa Elementary Principal Karen Gray. In her nomination she wrote, "I would like to nominate David Scott our new Substitute Coordinator, for his fantastic customer service to our schools. At Fort Lewis Mesa Elementary we have three substitutes that we regularly use and we try and call them first before putting in an absence. On several occasions we have been unable to fill our absences in advance and in those situations David has called us to see how he can help support the unfilled position. David is always helpful, polite, cheerful, and willing to help however he can. It is a pleasure to work with him. David's dedication to his job shows through his work ethic and his willingness to go above and beyond in supporting our school. THANK YOU David, we appreciate the extra efforts you go through to support us. We appreciate all that you do!" The Bravo! Award for the week of January 15th went to DHS's Information Technology Teacher & Librarian Valeria Skarbek. She was nominated by DHS Paraprofessional Rebecca Appel. 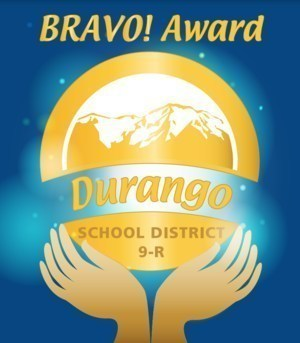 In her nomination she wrote, "I am happy to nominate Valeria (Val) Skarbek, the Durango High School librarian, for a Bravo Award. The Durango High School librarian, who had been here for several years, retired last year and as his replacement, Val is in her first year as the DHS librarian. Taking on such a large role at DHS could not have been an easy task; however, Val has already been a tremendous addition to DHS. She has already implemented new systems and guidelines in the library that have helped to ensure that our library runs smoothly. Val is so kind to our students that it helps make for an atmosphere of positivity in and around the library. Her currently display of a thankfulness tree is artistic and interactive. She plans to turn the tree into a resolution tree around the first of the new year. Thank you Val for being such a warm and inviting staff member during your first year at Durango High School!" The Bravo! Award for the week of January 22nd goes to Riverview Elementary 3rd Grade Teacher Matt Ogburn. He was nominated anonymously. In their nomination they wrote, "Matt has always been known as a student first, innovative teacher, and this year is no different as he pioneers a co-taught classroom at a new to him grade level. The reason for this nomination, however, is to bring to light the extra hours, energy, and commitment he has made to help our students feel connected to our school. Knowing that many of our students struggle with unstructured time at recess, and that recess is where most office referrals originate, Matt designed and developed an alternative recess for our 2nd and 3rd grade students. The SK8 club, which promotes skating of all kinds, is open to all 2nd and 3rd graders 3 times per week. This program has not only led to a decline in office referrals, but it has also built positive character traits, perseverance, determination, self confidence, problem solving, and creativity, among some of our most vulnerable students. Wanting to open the club to more students, Matt independently sacrifices his planning time 3 times a week to open the club to 2nd graders. This is in addition to the work he does outside of school, building ramps, storage racks, and obtaining gear for students. Lastly, the SK8 club also teaches students to maintain and build boards. If you would like to purchase a board built by the Riverview SK8 club, contact Matt. Thanks for going way above and beyond Matt! Riverview is so appreciative!" The Bravo! Award for the week of January 29th went to Escalante Middle School Writing Interventionist Michelle Fletcher. She was nominated anonymously. In their nomination they wrote, "I would like to nominate Michelle Fletcher from Escalante Middle school. She works hard for the students and staff here at Escalante. She mentors other teachers, she is currently working with all grade levels as a writing interventionist. She has also been an English teacher here. She is very creative and supportive in the way she teaches and helps students. She has even gotten a few students published in Teen Ink. "